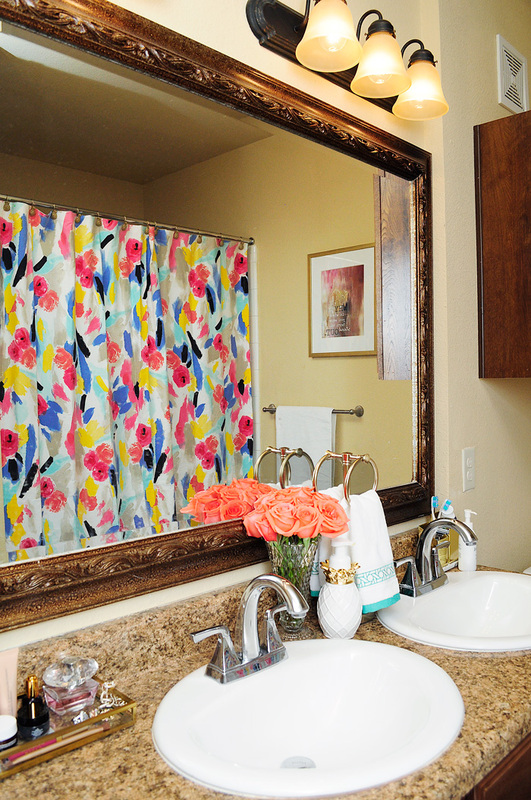 I’m excited to partner with Bed Bath & Beyond for this spring refresh bathroom makeover post. All opinions and fabulous new accessories are my own. 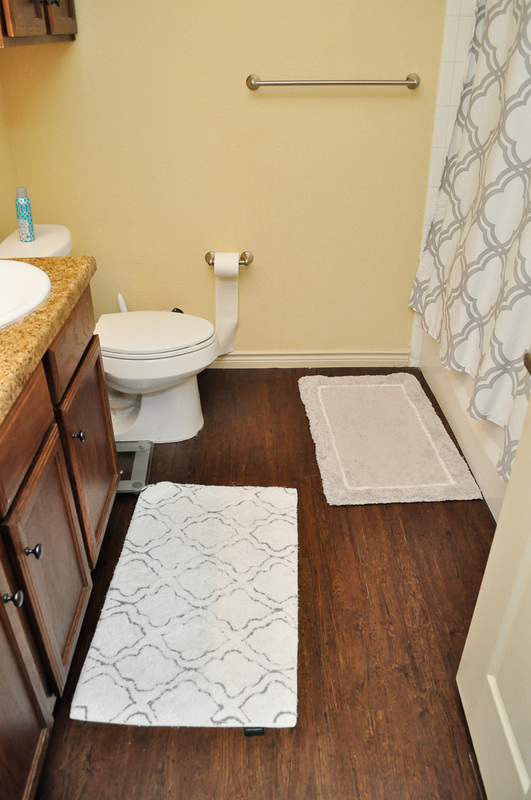 Once we decided to build a house, I kind of swore off doing anymore projects at the apartment, but I also couldn’t resist partaking in a spring refresh for our master bathroom. 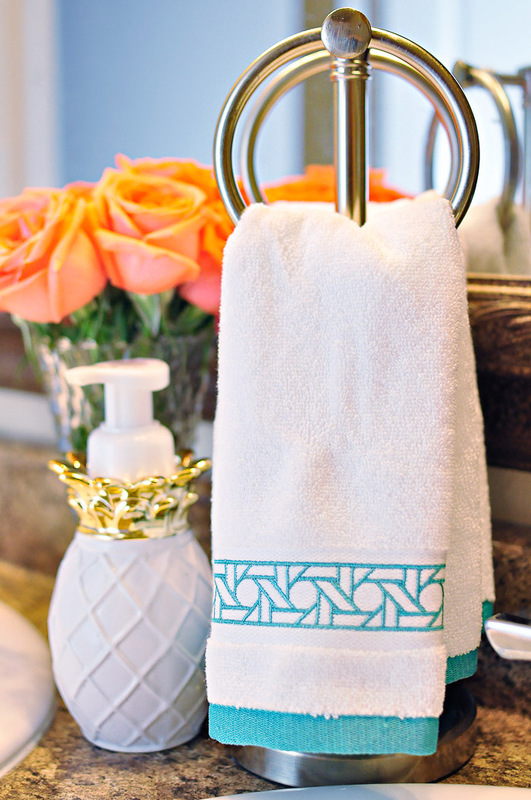 Partnering up with Bed Bath & Beyond was absolutely perfect for a mini-spring refresh of this drab space made sense, and it’ll likely be the décor we use in the new house for the guest bathroom. 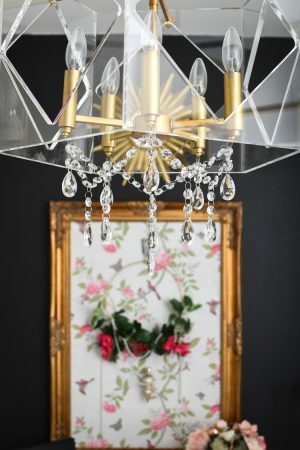 I initially looked online at their website (their website has a ton of stuff, even furniture/home décor), and then I decided I wanted instant gratification and headed to one of their stores to shop. 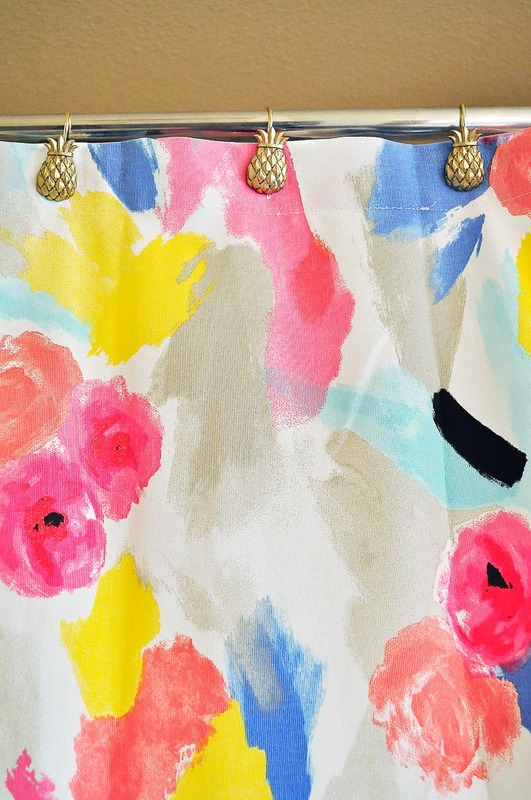 I knew I wanted something kind of funky and floral as a nod to spring/summer, and I love all things Kate Spade, so the Kate Spade Paintball Floral Shower Curtain was the perfect choice. 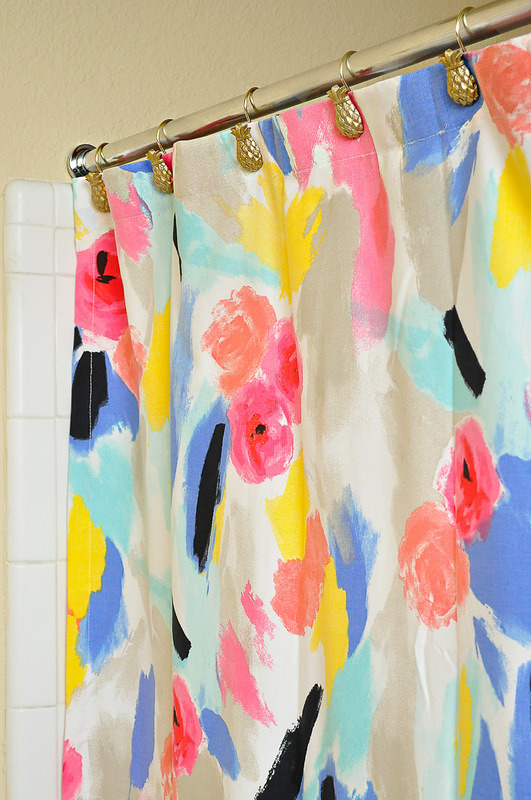 I love all the colors and abstract nature of the shower curtain…truthfully it’s something I usually wouldn’t pick, but I am so glad I did. For the shower hooks, I grabbed some glam Tommy Bahama pineapple shower hooks to incorporate some gold into the mix. 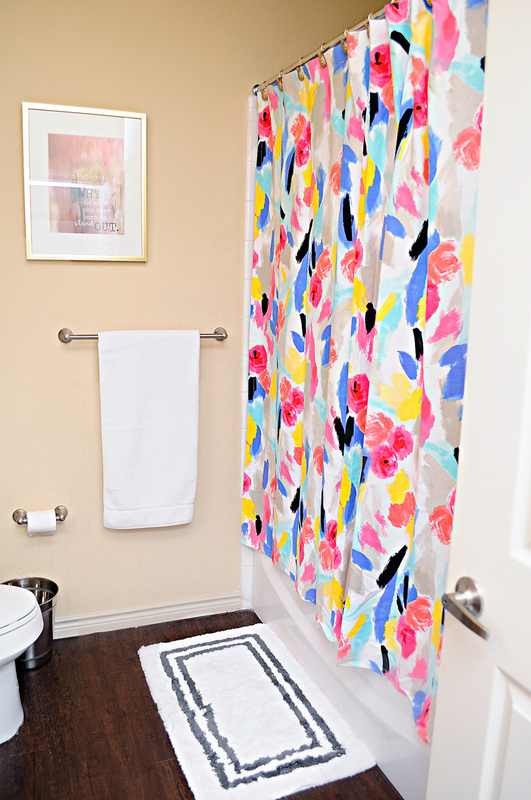 As much as I love the shower curtain and hooks, I am smitten with our new fluffy bath mats by Wamsutta. When I got out of the shower last night after putting this room together, I was so happy to step out onto something so luxe. I’ll never buy another brand of bath mats! I put on slippers for this shot because I need a pedicure very badly. 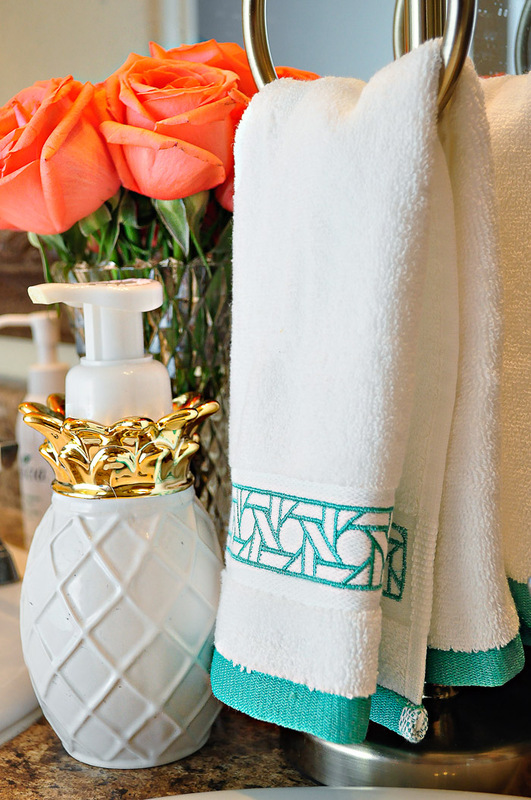 For our tiny vanity countertop, I added a brass hand towel holder and two fingertip towels by Coastal Living that bring in one of the colors from the shower curtain. It looks fabulous with our pineapple soap dispenser. 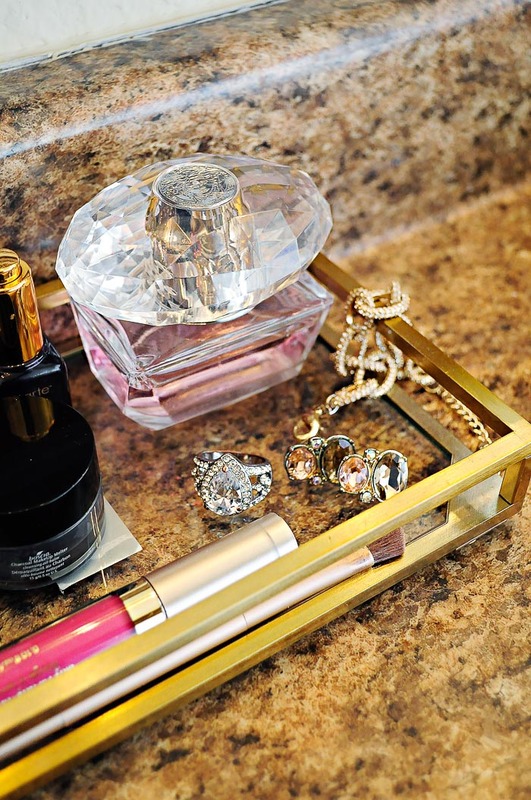 My side of the vanity was cluttered, so I took this opportunity to throw out nearly empty bottles of product to make room for my sleek brass glass vanity/valet trays. 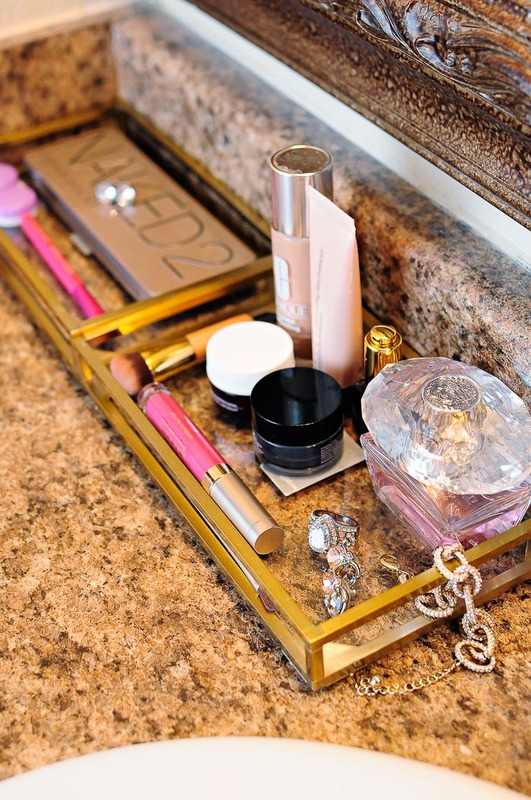 These trays are heavy and are perfect to hold beauty products I use daily. 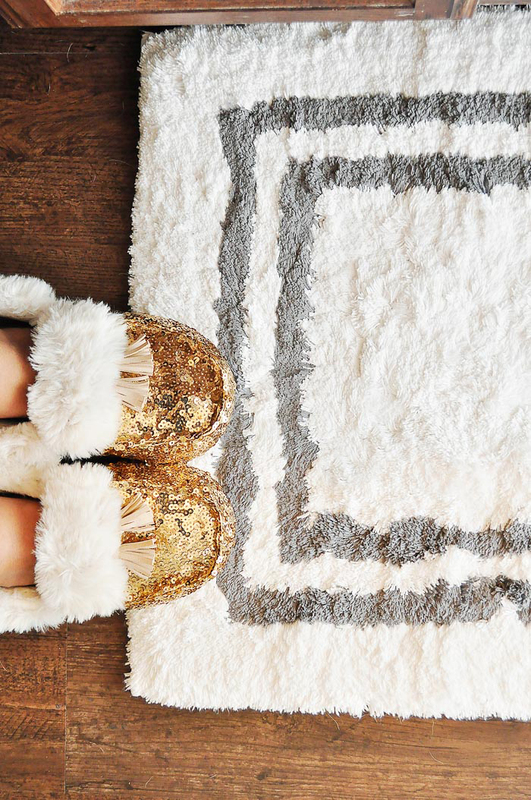 This mini-makeover makes a boring space seem more glam, luxe, and relaxing. I plan to enjoy this until I have to pack it all up for our move in early-September. Is it bad to start counting down the days already…we’re so excited about our new home! Oh and I also finally got a proper trash can instead of our $1 store plastic one. So grown-up. 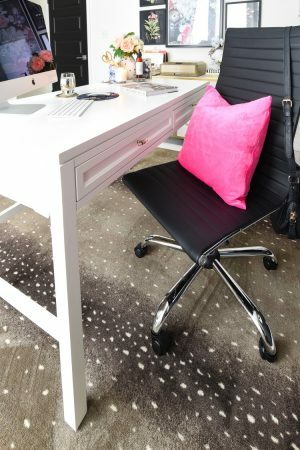 Sometimes I think we all get caught up in thinking a room refresh has to involve a huge undertaking, but it can be as simple as changing up a few accessories to something a bit bolder, bringing in a fun and functional accent furniture piece, or even bringing in a new rug or runner. 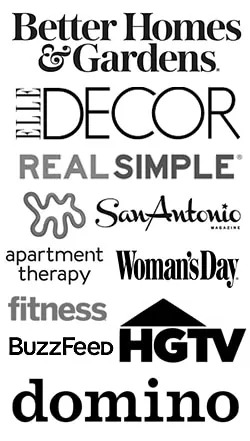 Bed Bath & Beyond has everything you need for any room of your house (including furniture AND decor!) at both your local store and online. Plus, their coupons are seriously fabulous! I get them on my phone and love saving some money everytime I go in for our Simple Human trash bags. I’ll be back next week with a cost breakdown of chrome vs. brass kitchen items (read about that conundrum here)…I’ve gotten a few emails saying the costs can’t be that different, but they totally are! 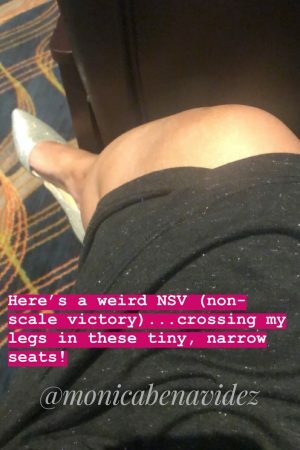 We’ll dive in on the next post. Have a happy and safe holiday weekend, friends. It looks fabulous. I am so excited for you about your new house.